In 1924 a summer fair in Kent, Connecticut, sparked the rediscovery of a major American artist when local residents put several nineteenth-century “ancestor portraits” on display. The strikingly similar canvases depicted graceful women with long slender necks leaning slightly forward within gleaming dark backgrounds and firm men in dark suits, often holding newspapers or books in their hands. The artist, who was then unidentified, was given the appellation “Kent Limner.” It was not until 1965 that Barbara and Larry Holdridge, with the support of Mary C. Black, convincingly demonstrated that the Kent Limner portraits were linked to several other disparate bodies of work and that all, in fact, were painted by a single artist—Ammi Phillips—at different points in his career. For more than fifty years, Phillips—whose biblical name fittingly means “my people”—portrayed hundreds, perhaps thousands, of his friends, relatives, and neighbors in New York as far north as Ticonderoga in the Adirondacks, south to Bedford, in Westchester County, and throughout the border areas of Massachusetts, New York, Vermont, and Connecticut. Phillips was born in Colebrook, Connecticut, in 1788. He was already traveling as an artist by 1809, when he advertised from William Clarke’s tavern in Pittsfield, Massachusetts, that he would paint “correct likenesses.” Although no portraits are known from this earliest period, the young artist asserted in this and a subsequent ad, placed the following year, that he had extensive experience and would paint his clients with “perfect shadows and elegantly dressed in the prevailing fashions of the day.” This promise became a leitmotif of Phillips’s work over more than fifty years, from the early romantic portraits of Harriet Leavens and Harriet Campbell—who appear in the guise of fashion plates replete with Chinese silk parasols and reticules—to his last portraits of the 1860s. When Phillips initially traveled from Connecticut to the Berkshires, he may have been attracted by the presence of a family member, John Ayer, who had purchased land in Egremont, Massachusetts, as early as 1781 and could have introduced the young man to potential customers. Phillips might have been influenced in this formative period by another artist, J. Brown, who, working in Cheshire, Massachusetts, in 1808, painted a portrait of Laura Hall. Clear parallels can be seen between the full-length standing portrait of Laura Hall and Phillips’s earliest known efforts, the portraits of Pluma Amelia and Charles Rollin Barstow, painted in 1811. Phillips married Laura Brockway of Schodack, New York, in 1813, and started a successful pattern of patronage that would continue throughout his life. Unlike many itinerant artists, who traveled a wide radius seeking commissions, Phillips established himself in a community and then painted in the area for a period of years. This permitted a familiarity between artist and client that is evident in portraits that are acute personal studies. The portraits of these years are ethereal in color, large in scale, and minimal in compositional elements. Phillips at this time instituted the compositional convention of males seated with one arm swooping over a chair back. By the 1820s, the portraits were reduced in scale but projected an increased drama through strong color contrasts, a style that was fully realized during the Kent period. 1. The Holdridges published their premise that Phillips was the Kent Limner and the Border Limner, as well as the artist of additional groups of nineteenth-century portraits, in “Ammi Phillips,” Art in America 48, no. 2 (summer 1960): 98–103. Here they established that the inscription and artist’s signature on the 1840 portrait of George Sunderland was in the style of the Kent Limner, and that the same name was found on early nineteenth-century portraits in the style of the Border Limner. However, it was not until the exhibition “Ammi Phillips” was presented at the Connecticut Historical Society, in Hartford, November 1965–February 1966, that the artist’s development was visually traced. This was expanded in “Ammi Phillips: Portrait Painter, 1788–1865,” an exhibition presented by the American Folk Art Museum in 1968. 2. 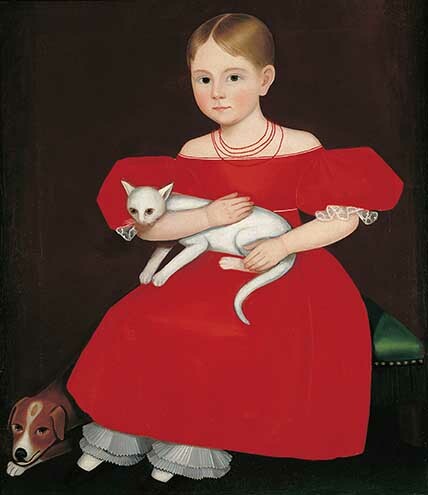 In the checklist of extant works compiled by Howard P. Fertig and published in Stacy C. Hollander and Howard P. Fertig, Revisiting Ammi Phillips: Fifty Years of American Portraiture (New York: Museum of American Folk Art, 1994), more than six hundred artworks are cited. Based on the rate of work indicated by inscriptions and bills of sale, Phillips scholar Mary C. Black estimated the artist probably painted considerably more than this number during his working life. 3. These advertisements in the Berkshire Reporter were discovered by Christine Oaklander and published in Eleanor H. Gustafson, “Collectors’ Notes,” The Magazine Antiques 138, no. 4 (October 1990): 662, 698. To date, they are the only known advertisements placed by Phillips. 4. Collections Fogg Art Museum, Harvard University, Cambridge, Mass., and Sterling and Francine Clark Art Institute, Williamstown, Mass., respectively; see Hollander and Fertig, Revisiting Ammi Phillips, 29. 5. Paul S. D’Ambrosio and Charlotte M. Emans, Folk Art’s Many Faces: Portraits in the New York State Historical Association (Cooperstown: New York State Historical Association, 1987), 51. 6.Phillips was boarding with Dr. Samuel Barstow in Great Barrington, Mass., when he painted members of the doctor’s family. The portrait of Pluma Amelia Barstow is a nascent effort modeled on Brown’s portrait of Hall; see Colleen Cowles Heslip, Between the Rivers: Itinerant Painters from Connecticut to the Hudson (Williamstown, MA: Sterling and Francine Clark Art Institute, 1990), 55. Phillips continued to develop this format, which reached its culmination in the portraits of Campbell and Leavens. By this time, Phillips had removed any extraneous elements, introduced a subtle floor plane, and developed a masterful command of color and composition. 7. Deborah Chotner, American Naïve Paintings: The Collections of the National Gallery of Art Systematic Catalogue (Washington, DC: Cambridge University Press in association with National Gallery of Art, 1992), 279, n. 4. In her entry on Phillips, Chotner points out that Brockway’s brother Reuben was a furniture maker in Cortland County, NY, perhaps heightening the artist’s awareness of chair style and decoration from this point forward. Source: Stacy C. Hollander, American Radiance: The Ralph Esmerian Gift to the American Folk Art Museum (New York: Harry N. Abrams in association with American Folk Art Museum, 2001), 399.